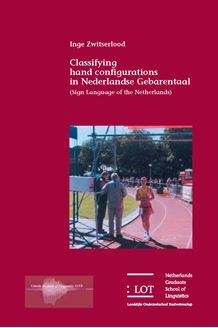 This study investigates the morphological and morphosyntactic characteristics of hand configurations in signs, particularly in Nederlandse Gebarentaal (NGT). The literature on sign languages in general acknowledges that hand configurations can function as morphemes, more specifically as ‘classifiers’, in a subset of signs: verbs expressing the motion, location, and existence of referents (VELMs). These verbs are considered the output of productive sign formation processes. In contrast, other signs in which similar hand configurations appear (‘iconic’ or ‘motivated’ signs) have been considered to be lexicalized signs, not involving productive processes. This research report shows that meaningful hand configurations have (at least) two very different functions in the grammar of NGT (and presumably in other sign languages, too). First, they are agreement markers on VELMs, and hence are functional elements. Second, they are roots in ‘motivated’ signs, and thus lexical elements. The latter signs are analysed as root compounds and are formed from various roots by productive processes. The similarities in surface form and differences in morphosyntactic characteristics observed in comparison of VELMs and root compounds are attributed to their different structures and to the sign language interface between grammar and phonetic form. This study is of interest to linguists studying sign language phonology, morphology, and morphosyntax. It should also appeal to investigators of linguistic classificatory systems. Finally, its contents will be helpful to developers of NGT dictionaries and education materials.